the Keitai Goddess : Murphy’s Law? 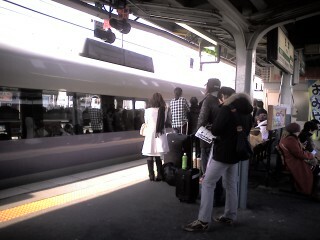 Train delay out of Matsumoto. Forces are conspiring to keep us away from home. You’re coming back in the “U-turn peak.” Hope you find seats on all the trains. Shinkansen are at 130-200% capacity now. Just walked in the door. Phew!! We got seats in the non-reserved car no problem. Heh, the “U-turn peak”, how evocative! Glad to hear you are home safe!